This is a brilliant main dish, but I realised after I made it that it’s an even more brilliant starter. It’s dead simple but incredibly impressive as it’s jammed to the walls with flavour predominantly from the dried Porcinis and their soaking liquor. The inclusion of the asparagus tips just adds that cut through. Kick off by cooking the Asparagus tips in a shallow amount of chicken stock, 2-3 minutes from boil – no more. Drain and sling into iced and lemon cold water immediately to stop the cooking and retain the vibrant green colour, drain and set aside – hang onto the cooking liquid it’s full of flavour. Get the Rigatoni on – salted water ( no need to oil the water by the way as some monkeys suggest – oil doesn’t mix with water which then won’t stick to the wet pasta meaning a waste of oil). In pan saute down your onions, pancetta and garlic, sling in the wine and reduce a little. Next in with all your mushrooms, leaving the Porcini liquid behind for the moment. Cook out and you’ll have a funny looking gloopy pan of stuff which isn’t particularly attractive BUT next sling in the cream and reduce a little, the sauce will now take on a brilliant Autumnal vibe. Let this sit on the heat and settle, loosen with the Porcini liquid as you need to – again your making a sauce here so regulate as you feel in terms of consistency and taste – get your fingers in and taste constantly. 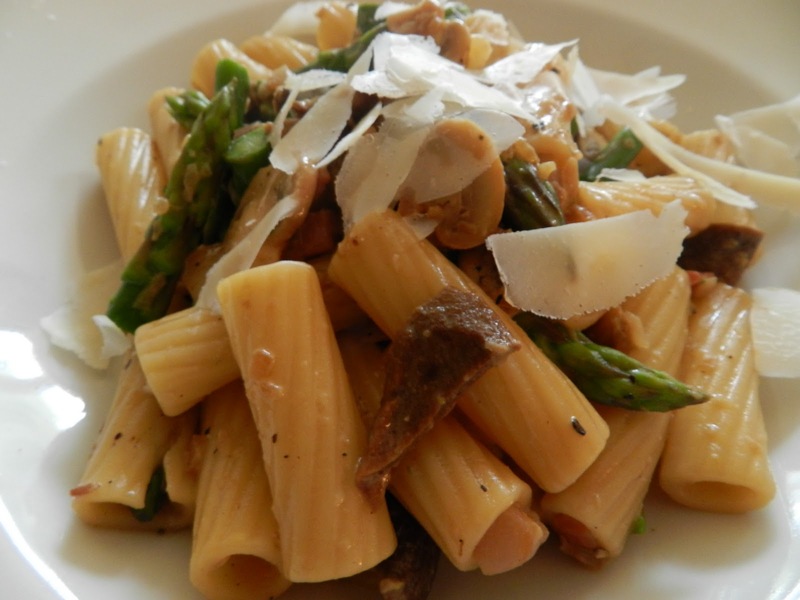 When the pasta is done drain it and then straight into the mushroom sauce along with the cooked Asparagus tips and your grated Parmesan. Quick couple of laps of the pan, season with the cracked black pepper then serve.